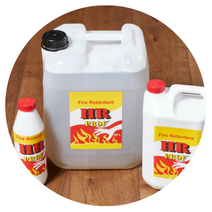 HR Prof timber treatment is tested and approved internationally and meets the classifications of Euroclass B-s1-d0, (UK class 0 on solid wood, Euroclass C-s1-d0 (UK class 1) on plywood, K1 10 and K2 10. HR Prof helps to extend the lifetime of treated wood, transforming it into a more fungal and blue stain resistant substrate. Once absorbed into the surface of the wood, HR prof combines chemically within the cell structure but does not form a surface finish, which allows the wood to breathe naturally. In the event of fire, carbon char is restricted to the immediate area – preventing the flames from spreading. Wood treated with HR Prof complies with EU construction products regulations, enabling customers to apply for a CE mark on treated timber. HR Prof is certified according to EU regulation number: 305/2011 (Construction Products Regulation). The product is easy to use and does not require a protective finishing coat. It is not harmful to humans, animals or the environment. HR Prof can be easily applied with a brush, roller, low pressure spray or vacuum. Typically three coats is sufficient, and these should be applied at intervals of 1 hour (minimum).